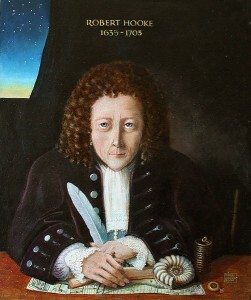 Robert Hooke. No portrait of Hooke exists today. This rendition was created by Rita Greer based on descriptions left by his colleagues Aubrey and Waller. July 18 is Robert Hooke’s birthday. Robert Hooke was an English polymath and a central figure in 17th Century English science. He was prolific in a wide variety of sciences and was a founding member of the Royal Society. Hooke was known for his mechanical aptitude. He was good friends with Robert Boyle and constructed the vacuum pumps Boyle used to conduct his research on gases. He served as the chief surveyor after the Great London Fire of 1666, where he performed nearly half the surveys himself. Hooke also proved to be a decent architect with his friend Christopher Wren when London was being rebuilt. A few of his buildings survive today. He served as the Society’s Curator of Experiments where he designed and performed several scientific demonstrations at each weekly meeting of the Society. Many of the devices needed to put on these demonstrations were built by Hooke himself. 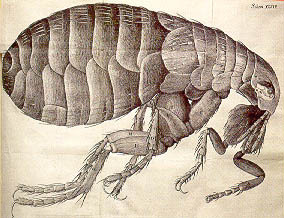 Flea illustration contained in Hooke’s Micrographia. The original image was nearly 18 inches wide and shows the extreme detail Hooke went to in creating these images. Hooke is best known for his work with the microscope. He wrote the Royal Society’s first publication called Micrographia. It was a collection of articles dealing with what Hooke saw using his microscope and showed people things they had never seen before. The illustrations contained within the publication were extremely detailed and drawn by Hooke himself. It was in this book that Hooke also coined the term ‘cell’ to denote the groupings of like structures in his observations. He also theorized that fossils were formed from previously living organisms after noticing petrified wood was very similar in structure to regular wood under the microscope. The prevailing theory at the time, dating back to Aristotle, was that fossils were formed when the Earth was formed. Hooke is also known for his work with springs. Hooke’s law states the force needed to compress or extend a spring by a distance is proportional to that distance. Simply put, it takes more force to pull the spring further. The novel part was that the relationship was linear. Hang a weight on a spring and it stretches a distance x. Add a second weight of the same size and it will stretch a distance equal to 2x. Another spring oriented project he worked on was to improve the pendulum for better timekeeping. He designed a spring driven mechanism that drove a pocket watch. Hooke sidelined the project because he could not find suitable funding to exploit his new device. Later, another scientist, Christiaan Huygens would patent a similar device and Huygens would get credit for inventing it. This led to another trait Hooke was famous for: he did not like others to get credit for work he felt he did. He worked on so many projects and would flit from one to another and never really finish any of them. When someone else finished something he had worked on before and would get credit for it, Hooke would get angry. It didn’t matter who he fought with, he would pursue his credit where he felt it was deserved. His most famous feud was with Isaac Newton. Hooke had the idea that gravity was probably a universal force and the closer two bodies approached, the faster they moved. This was seen in the orbits of the planets and comets. The closer they got to the Sun, the faster they moved. He shared this idea in correspondence with Newton. Newton obviously shared the same idea. When Newton published his theories of gravitation where gravity was a universal force between two that increased as the two objects got closer. He showed this force was followed an inverse square relationship. Newton was immediately famous for something that Hooke felt he had suggested. Another point that irritated Hooke was there was no mention of Hooke in Newton’s publication. When Hooke brought the subject up, Newton told him he didn’t influence his thinking in any way. Hooke only told him what he already knew from other sources. Both men would be hostile to each other for the rest of their lives. Unfortunately for Hooke, he died before Newton. When Newton became president of the Royal Society a short time later. The Society was moving to a new address and Hooke’s portrait and experimental effects went missing. Some have said Newton lost them on purpose, but nothing was proven. No one today knows for sure what Hooke looked like. Some historians listed him as a short hunchbacked man with popping eyes and fine unkempt hair. His friends; descriptions painted the opposite picture of the man. It would be centuries before his contributions would be better brought to light. Much of the newer information comes from Hooke’s own diaries which surfaced in 1935 and shows his notes on a variety of subjects. They show a man who was a thinker ahead of his time and not the mean-spirited ogre history had provided us.